Want to get some email marketing campaigns off the ground but aren't sure where to start? Got an email marketing program in place but it’s not growing as fast as desired? 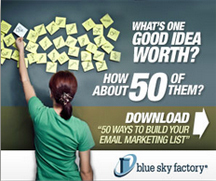 Blue Sky Factory has published 50 Ways to Build Your Email Marketing List, a new free eBook that will help marketers grow their lists at a phenomenal rate. Each section is filled with bite-size tips that marketers can try out in their own programs. Some will be just right for any organization, while others may be ideas to put on the shelf until a later date. Try them out and see what works! Plus, there’s a printable “cheat sheet” that includes all 50 tips so they can be hung up at a desk. The eBook is available in PDF format and can be downloaded for free by clicking here. So, you want to make a career change, but you don't want to go and work for a stuffy corporate organisation again. You're not suited to the cubicle life and being bossed around. But at the same time you don't want to set up your own business and take on all of the responsibility that that brings. Have you considered freelancing? This is a good option for someone who doesn't enjoy working in a structured environment with a boss constantly looking over their shoulder. Freelancing means that you will self-employed, your own boss, but still get your work flow from organisations - you could say it offers the best of both worlds. This is true, but only for someone who can actually work well on their own and keep motivated that way. Below are some of the benefits and disadvantages of being a freelancer and working from home. Consider all of these before you decide to make the leap. There's no one to boss you around and tell you what to do except yourself. Your time is your own - you decide if and when you take time off. You can work hard one week so that you can ease off on another. It's flexible and up to you. If you work on a contractual basis, take on temporary roles or work solely on specific projects you will find it is a much more lucrative way to work. You can work from home: in your nice comfy home office, on the sofa, even in a funky caravan in the garden if you like. You can wear what you like, start when you like, take breaks when you like. Joy! And following on from this: No more office politics! No more walking on egg-shells around that moody manager from finance, no more office gossip, back-stabbing or sucking up. You can just relax, be yourself and get on with it. Hang on, that's a good thing, isn't it? Well, yes it is, but only if you are good at being your own boss and keeping yourself motivated, disciplined and free from distraction. You can't hide within an organisation anymore - you are the salesperson, the marketing department, customer service, everything. Success or failure - the buck stops with you. You must be able to deal with that and have the confidence to take on all of the aspects involved in being a successful freelancer. The best advice I can give here is when you are deciding what work to do, do something that you really believe in, and something you know you can do well, that way things like sales and marketing yourself will feel authentic and come naturally. Just because you are at home, you must be careful not to stay in 'home' mode when you are working. For this reason some people actually prefer to dress smartly and have a proper desk at home. You don't have to do this, but just be careful you don't get sucked into doing household chores to avoid a boring project, for instance. Have a clear agenda of what needs to be achieved every day, how long it will take and then stick to it. It's also wise to inform people that just because you are at home doesn't mean you are available for tea, coffee, chats all day long - unless you want to and you have the time of course! You may earn good money when you are working, but freelancing inevitably means that work will be up and down - sometimes you will be busy and sometimes things will be quiet. You must be good at budgeting to see yourself through the quiet times. And almost more importantly, you must be able to handle it mentally - it can be tough when you don't know where your next pay cheque is coming from. So, do you still think freelancing is the route for you? Whatever you decide is fine, just make sure whatever you do, you do it with your eyes wide open. Good luck! If you are struggling to figure out where to go next with your career, perhaps working with a life coach would help you? It's a great way of clarifying what you really want to do, and then keep you motivated to achieve it. Bebhinn O'Loingsigh is a Life Coach at Hightail Coaching Solutions. She works with professionals who feel unfulfilled, stuck in a rut, or burnt out and want to make some big life changes. Whether you want to take a career break to get a fresh perspective, change your career, start your own business or completely overhaul your life, Bebhinn can coach you through the process and out the other side. If you are looking for ways to make more money for yourself to make ends meet, you may consider using your expertise, as well as your specialized equipment, to do side jobs and weekend work on your own. There are many ways to freelance your skills to those looking for a one-time gig, and finding your own personal clients away from your nine to five day job could bring you big rewards. While not putting yourself in situations that may be illegal, or be considered a conflict of interest by your company, you could still make a good chunk of cash by simply using your skills during your off time. For example, maybe you are a photographer that works for a company that does portrait work or family photos in a studio. If you took on some weekend work doing weddings and birthday parties it could help you make more money and still not be in direct conflict with the company you work for. This type of circumstance would most likely not anger your employer nor be considered illegal in any way. Beyond photography, there are other freelancing jobs you could take on if you have the skills. Writers often sell their work individually as well as all sorts of other artists. You can make more money through these means once you begin to establish yourself with different clients who like your work and trust you can meet deadlines. With the technology we are dealing with today, you can find all kinds of freelance opportunities as well as one time jobs doing everything from music gigs to modeling, and even specific trades like carpentry and plumbing jobs. Unlike many years ago, these jobs where often found through someone you knew, or by just pure luck. All kinds of different opportunities could make more money for you if you merely seek them out. Ultimately, if you want to make more money and potentially turn a one time job into something more, try out different avenues to get you where you want to be and do a good job when the actual job comes available to you. Be willing to prove your worth, and you may establish a long-standing relationship with a client or two that could keep you making money in the future. This relationship could eventually parlay itself into bigger and better things and can also be something to have on a resume as well. Times are tough and many people are looking for alternative ways to earn additional income or to cut back spending. Every day more individuals are turning to freelancing as a solution to the challenges of our current economy. Many project managers, CEOs and entrepreneurs are delegating some of their workload to professional freelancers. If your thinking about jumping into the outsourcing community and earn your living freelancing, then you will want to keep reading. I will reveal to you (5) helpful tips to get you started off right. Not everyone has the luxury of starting out with money tucked away but it would be very helpful to you if you can save money up before you plunge into freelancing. Even if your currently employed and only doing freelancing as a side job, your creative powers will flow alot better without the pressure that comes when you are short on cash. It is important to carefully consider different factors such as your skills and experience and what the market will bear when deciding what prices to charge for your services. Many new freelancers eager to gain as much work as they can start out setting their prices too low. While it may be helpful to get started by charging a bit less than others, be sure to first do research on what prices are currently being offered for your field. You don't want to sell yourself too short. Remember that you reflect those in your industry. If you accept too low a fee this will affect how others are able to price their projects. There are many excellent tools you can use online that will make your freelancing career more productive. Using time management tools will save you alot of money and time. Working Decide where you will work. Do you have a home office free of distractions from others where you can close the door or perhaps you "office" is in a more central location like the family room. You may even consider renting a desk space in small office. I saw an ad in the local paper last week for such an offer. A small computer company was renting out a desk space for a web designer with the promise of a bit of work on the side. Wouldn't that be just perfect if your a web designer? Network With Other Outsourcers Get out there and mingle! There are lots of great places both online and offline where you can connect with others. Websites such as Facebook, LinkedIn and MeetUp are excellent online resources for networking. Following the above steps will help you build a strong foundation for freelance business. One more thing to remember... when your a freelancer it is often feast or famine. While it is true that you want to be careful not to line up more work that you can handle, you do want to be sure to always keep marketing. You never know when a project your about to do becomes cancelled. Facebook Pages have great SEO benefits because they show up very high in search results for your business. This is because Facebook lists Pages on individual users' public search listings, thus every user who ‘likes' your Page is instantly adding another link back to your Facebook Page, improving your Page's search engine ranking dramatically. On top of this a Facebook Page also provides numerous additional links back to various areas of your website, improving the search ranking of your site. This is the most exciting prospect of a Facebook Page. Facebook Pages can facilitate all kinds of 2-way communication between you and your market. In the simplest form this can be done by updating the Page's status to let your customers know about a particular product or service; and then the members of your group can comment on this and so starts a direct conversation with your customers. Likewise, this can be used to update your members about any changes to your business, any promotions or even to facilitate a competition. However there are also far more creative ways of engaging your customers. Facebook Pages allow for customised applications on your Page and these can range from “join our mailing list" data capture boxes (which increases the reach of your email marketing) to special features, games and competitions. There's more than just your communication with consumers, there's the communication between the members of your Page themselves. A Facebook Page is a great platform for people who like your company to talk to each other about their experiences of your business, and why they like your brand. They may even recommend your products and services to each other. This is a brand community and it can be very beneficial as it facilitates and cultivates enthusiasm for your brand. In this way brand communities can strengthen members' identification with your brand, helping to boost brand image as members pass their message on to others. And the great thing is that because it's on a Facebook Page it's easy to track and influence, so it's really easy to build brand loyalty among your members. Having such personal communication available through your Facebook Page is undoubtedly going to have numerous benefits, one of which is that you can see directly what your customers are saying about your brand, products and service. This of course can enable you to resolve any customer issues or queries, and gain much more product and service feedback than you might otherwise receive. This kind of information can also prove vital in market research scenarios as communication from or between your Facebook Page members provides you with important consumer insights, which might lead to helping you to improve your product or service offerings. A Facebook page is a great additional presence for your business online and greatly compliments you existing website. Your Facebook page can essentially be an extension of your website, and serves to drive increased traffic to your site. With numerous links back to your site, your Facebook Page becomes yet another route through which potential customers can find and reach your website. Because Facebook Page members choose to become so, they open up the way for you to keep in constant contact with your market through uploading content whenever you want. This content will then show up on your members' news feeds, giving them information about your business in a non-intrusive manner. Members might even look forward to new content being added. You can upload news, pictures, videos… virtually any form of content, so the opportunity for creativity to entice your market is ever present. For example, the Australian Working Holiday Facebook Page (below) has uploaded videos advertising various experiences and adventures in Australia. You may wonder just how much exposure this actually is; well, considering the average Facebook user is signed in for over 6 hours a month, that's a lot of potential time in direct contact with your market. This is also measurable and can be seen with Facebook insights, discussed next. Having a Facebook Page means you have access to key information about your members. These advanced insights include graphs and stats on the type of users on your Page including male/female split, ages, locations, and other demographic data, the number of active users on your Page, details of their activity and interactivity with your content, and more. This information is not only useful for improving the Facebook Page itself but also gives useful insights into your market as a whole. You can also invite your members to vote in a poll of your creation (yet another consumer interaction possibility), generating more useful data about your market. Ever heard of the 6 degrees of separation theory? Well Facebook is where you really see it work. An average Facebook user has 130 friends in their network, and if one of them “likes" your Facebook Page, potentially all of their 130 friends could see on their news feed that they have “liked" you. Which, in turn, might cause them to investigate, and see your Facebook Page for themselves. Perhaps they'll also “like" your Facebook Page. Now imagine this process several times over. The potential reach of your Facebook Page is huge. There are approximately 27 million active users of Facebook in the UK – that's approximately 45% of the population. A recent study by Chadwick Martin Bailey and iModerate Research Technologies, found that 60% of Facebook Page members are more likely to recommend those brands since becoming a member. And an impressive 51% of Facebook members are more likely to buy the brands who's Facebook Page they are a member of. As mentioned Facebook has a phenomenal potential reach, hence Facebook Pages are a great way of spreading the word to new customers and getting your brand known. Also quite apart from the huge reach, a Facebook Page can be completely customized and branded, thus it can become almost as powerful a marketing tool as your website itself. The Page itself on Facebook is completely free - so you're contacting and engaging with your market, and achieving all these benefits completely free. The recent UK recession has resulted in more and more people turning, either voluntarily or by necessity following redundancy, to freelancing. Not all business sectors use freelancers to the same extent, so if you are not a computer consultant, web designer, graphic designer, copywriter, illustrator, photographer or journalist you may find it quite hard to get work. However, the use of freelancers is becoming more common and, ironically, many people freelance for a former employer even after being made redundant. Freelancing involves working under contract for a customer; you will either be self-employed or an employee of a service company. In legal, tax and practical terms, freelancing is very different from being an employee. In the UK, there is a mid-way category, the agency worker. Such workers gained rights similar to employees recently, but most true freelancers will not fall into this category. There are pros and cons to being a freelancer; weighing the two against each other is difficult and the outcome varies from person to person. The pros (advantages) of being a freelancer are: more money; flexibility; variety; less tax; and better "work-life balance". Freelancers, in general, earn more than an employed person doing the same job. Of course, there are good reasons for this (see cons below) but it does mean that you do not have to work full-time. As a freelancer, you can choose who you work for and frequently when, where and how you work. You have more control over your working life. However, when times are hard you may have to take whatever work and working conditions you can get. Of course, there is a limit to your flexibility - you will probably have to fit your holidays in between contracts. Good freelancers can choose to work on a range of projects for a variety of customers, giving opportunities to utilise and build upon their skills. The general perception is that UK self-employed people (including freelancers) pay less tax than employed people do. Although, this is largely true, there are legitimate reasons for it, including the fact that the tax rules for "deductable" expenses are more generous for the self-employed than for the employed. However, "work-life balance" is frequently given as the most important advantage of being a freelancer. Many argue that in this day and age the freedom to distribute your time between work and leisure however you wish is priceless. The cons (disadvantages) of being a freelancer are: lack of job security; continuous change; you have to run all aspects of your business; isolation; and new tax legislation. Freelancers have very little job security. They are not guaranteed continuous work and do not receive benefits such as sick pay and maternity or paternity pay from their customers. Some state benefits may be receivable, however, if the freelancer is an employee of their own, or a shared, service company. Freelancers may move from contract to contract frequently. Many find this quite disruptive. To be successful you need to be able to adapt to new situations rapidly. Being a freelancer means setting up and running a business and all that that involves. There are a number of possible business structures in the UK that a freelancer might consider, including: sole trader, partnership, limited company, limited liability partnership (LLP) and umbrella company. The legislation that applies to the governance, statutory returns, tax rules, tax returns and financing differs for each structure and sound professional advice is essential. If you work from your home as a freelancer, you have to work without the support of colleagues. You will not have access to, for example, the company library and technical department. Recently, the UK tax authority, HM Revenue & Customs (HMRC), has attempted to clamp down on perceived abuses in the UK tax system. The self-employed, and particularly freelancers, have borne the brunt of this attack, witness the 'IR35' and 'Managed Service Companies' legislation and the 'Arctic Systems' case (that HMRC took all the way to the House of Lords, and lost). Further clampdowns are expected, despite the Government's promise to reduce "red tape" for business. From the above, it may seem that the balance is tilted firmly in the direction of the 'cons'. However, you can outsource much of the legal, accounting, tax and administration to a management company or firm of accountants and you can even employ an agent to assist in your search for freelance work. If you do this, you will probably find that the decision is obvious to you; you are either a freelancer or you are not. Clive Goodhead writes about various business and internet related subjects from his base in west Cornwall, United Kingdom. Clive also manages 'Marazion Guide', your online guide to the ancient charter town of Marazion, situated on the shore of Mount's Bay in the far west of Cornwall in the United Kingdom. As well as being one of the most popular holiday destinations in the United Kingdom, Marazion is the "gateway" to the world famous St Michael's Mount. To read more about Cornwall and, in particular, Marazion and St. Michael's Mount visit Marazion Guide. If you have the right skills to be a freelancer of a certain art form, you could have a way to make money fast as you ply your wares to those who are looking for what you have. Freelance writers, photographers, actors, and painters all make money with their skills. There are even independent reporters who sell their stories, and we all know about paparazzi who continually are harassing famous people at restaurants and grocery stores all over the world. All of these people work hard at giving their prospective clients what they need in order to make their money. Freelance writers sell their work to prospective newspapers, magazines, and even traditional publishing houses that may be looking to put together compilations of poetry or short stories. Even more common now are those who sell their work for the Internet in the form of blogs or online news agencies. Photographers can sell their photos to magazines and newspapers as well as organizations that are looking for specific photos. These photos can range from the ultra-artsy to scientific or natural science photos. Many photographers make money fast once they start developing clientele that they continue to feed great photos to. Painters and artists of all kinds could do freelance work such as mural painting or supplying sculptures to cities or states that support their work. Artwork can be sold to businesses or hotels, which helps out both parties by having nice décor in the hotel and supporting the artist's work on the other side. Independent reporters are always seeking out the latest news stories and trying to sell them to news agencies or even television stations. These reporters often work with photographers to establish their stories quickly and with compelling photos to back up their stories. All in all, many freelance professionals make money fast with their work, and can always be asked to do things with more specific terms than some employees of big companies can do. If a company wanted to get a good picture of an erupting volcano, they may not send their own people to the location to do the dangerous work, but merely put a price on the perfect photo and see who comes back with the best shot. This type of work is always available to those who can handle the uncertainty of it all, but the rewards could be quite good in the end.